Europa’s father John Eden is a NATO undercover agent fighting organised crime. Born DONNA EDEN. A professor in biotechnology and nanotechnology. She is a committed environmentalist and an advocate for clean oceans and indigenous rights. Her love for the oceans and the environment very much shaped her belief system growing up. During her adult years, she always chose jobs which allowed her to go out and explore the world, no matter how difficult. While involved in an archaeological adventure she crossed paths with Adam Andros and his father. The events she witnessed that day caused her to assume the identity of Europa, and work alongside Captain Euro. 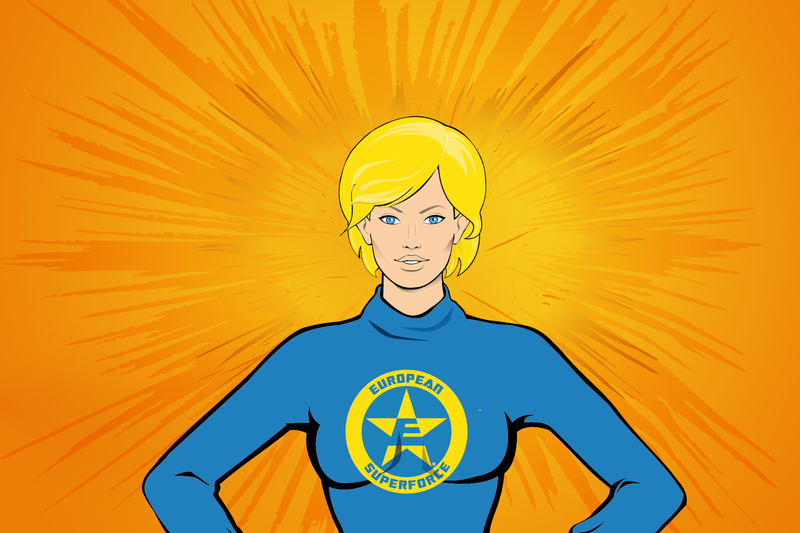 As part of CAPTAIN EURO’S team, she aims to share her values with the rest of the world, for the good of mankind. She believes that the principles which she adheres to as an environmentalist; rights of mankind, of long-termism, sustainability, and holistic thinking, can be applied to most, if not all of the global challenges faced by humanity today. Within CAPTAIN EURO’S team, she ensures that all of the work performed by the team, from R&D, to the transport, to their energy is sustainable and green. While studying for her doctorate in archaeological oceanography, Europa spent 6 months in the Artic (far northern Sweden, Norway, Finland and the Kola Peninsula of Russia) with the Saami people, known in English as Laplanders, to learn their fishing techniques, traditions and customs. She is an expert scuba diver, having explored the darkest depths of the oceans both for fun and for study. Friends often joke that she is a “fish out of water” because of her incredible swimming abilities and love of the ocean. Over time, she has trained in the ability to breathe underwater. She can breathe underwater for up to several minutes at a time, and is an extremely fast and capable swimmer. An expert on the impact of oil spills, Donna has been called upon to lead several research trips to determine damage following environmental disasters including the Deepwater Horizon Disaster in the Gulf of Mexico in 2010. The best day of her life was when she was able to save a fin whale stranded on a beach in the Mediterranean island of Crete. Europa’s strong beliefs can lead her to be a touch hot-headed and passionate at times. She is extremely generous and selfless, and this instils a fierce loyalty to her in her peers. Most people who know her admire her tenacity and willingness to stick to her guns, but still concede a point when she realises she is wrong. Naturally, Europa and the water are nearly inseparable. She swims for 2 or 3 hours a day, almost every day! As such, she is extremely strong and has fantastic endurance, and is one of the fittest members of the CAPTAIN EURO team. She can actually outrun and outswim CAPTAIN EURO in a head-on contest! The two often put their wits and skill to the test in sparring competitions, which also help to keep them fit. Europa tends to win out during the longer fights which require endurance, and Captain Euro fares better when he can capitalise on his size advantage and finish fights quickly. The two are very evenly matched and their friendly rivalry in the sparring ring can sometimes carry over into their relationship. Europa is the only member of CAPTAIN EURO’S EUROPEAN SUPERTEAM to have known him before he assumed that identity. The two of them, thus, have the strongest rapport and relationship of anyone on the CAPTAIN EURO team. In many ways, she is the Ying to Captain Euro’s Yang. Despite their very different upbringings, situations, and outlooks, they share common goals and values, which help unite them, despite their differences.